Rachel Cochran is a PhD student in Global History at the University of North Carolina- Chapel Hill focusing on the modern histories of South and Central Asia. She is also currently pursuing a Duke-UNC graduate certificate in Middle East Studies. Her research interests include Islam, empire, global intellectual history, capitalist transformations and religion, and the concept of the Persianate, with a specific focus on histories of Muslim reform. Hina Muneeruddin is a doctoral student at the University of North Carolina at Chapel Hill in the Islamic Studies track of the Religious Studies program and currently pursuing her graduate certificate in Women and Gender Studies. Her research lies at the intersections of Islam, gender, race, affect, and performativity. More specifically, she is interested in the quotidian scenes of subjectivity of American Muslim women. Yasmine Flodin-Ali graduated from the University of Wisconsin Madison in 2014 with a major in Cultural Anthropology and minors in South Asian and African studies. In 2018, she graduated from Harvard Divinity School with a Master of Theological Studies. 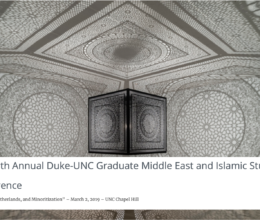 Yasmine is now a first year Islamic Studies PhD student at the University of North Carolina at Chapel Hill. She is interested in analyzing the relationship between religion and race as contemporary categories of differentiation. Yasmine’s dissertation research focuses on the racialization of South Asian and African American Muslims in the American South, from the 18thcentury through the present day. Arianne Ekinci is a PhD student in History at UNC-Chapel Hill studying how political states attempt to become culturally and historically-based nation-states through incorporation of borderland populations, with a particular focus on Uyghur experiences in the early PRC, and how minority or borderland populations negotiate citizenship and subjecthood as minorities, emigrés, and refugees. While Arianne has a strong background in China studies, her current research focuses on inter-Asian connections and the diverse experiences of women in the state.